The week your old scribe put fingers to keyboard to pen this review began dancing to a frenzy at the Belper Music Festival and ended with the Opera North productions of Donizetti's Mary Stuart (Maria Stuarda) and Dvorák's Rusalka. Domestic audio has to work hard to keep up with this company and all of the CDs featured this month has brought some flava of that live exitement to the living room. Looking in one of my old singles boxes there's still a copy of Sugar Beat (and Rhythm Sweet) with a small numbered sticker on the front from the playing order before the Groundhogs came on in Derby in about '85 and I've seen them live so often I've lost count. So the band is familiar. Actually 1/3 of the material on Chilled is too familiar, what in pub rock circles is known as "covers" but in jazz circles would be dignified by the term "standards"; NBZ know there's a limit to the number of times you can enjoy another rendition of Mustang Sally no matter how competent - and Nine Below Zero are as competent as it gets - so they surprise us all with an original version of Spanish Harlem instead. And just to prove a point further, this is an acoustic set. Not as purist acoustic as a pre Manchester Free Trade Hall Dylan. Nor would it comply with the old late '80s MTV unplugged rules, but acoustic it is. Excellent it is too, with almost audiophile quality production and mastering and playing that belies NBZ's pub rock roots. The other disc in the pathetic plastic sub Compact Cassette fragile jewel case that Angel Air insist on plonking CDs in (there are plenty of better alternatives) Refrigerator has become my favourite car CD to the extent that it was a wrench bringing it in to review. Its worth the price for this disc alone, a ***** outing. 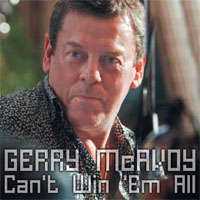 This album might be called Can't Win 'Em All, but McEvoy sure can win most. Mostly gems and few fillers on this solo outing. Raunchy boogie, dense dynamics, like coked up Canned Heat. this white boy plays the blues with the unique flavour born not from the cotton fields but from the urban troubles of Ulster. Sound quality is as clean as it oughta be for this genre with convincing drums despite some obvious compression and artificial reverb. Any slicker would devalue the performance, and an unusually convincing lateral soundstage for a multitracked recording; predictably little depth but what there is preserves the cymbals in the same plane as the skins, avoiding the close mike problem of cymbals too close for comfort. This disc remains in the current playlist stack next to the CD player. There's a certain irony in naming an album On The Rocks whose star was in the depths of alcoholism during its making and reliant on the organisational capabilities of friend, collaborator and workaholic, Robin George. Written over a year in David Byron's studio at his Surrey mansion, this album was a fraternal labour with contributions from musicians known to the songwriting pair, eventually forming the David Byron Band as heard here and the later '83 release Lost and Found. Bad Girl got its first airing among the 8 tracks of the original vinyl On The Rocks, recorded between two studios in England and Scotland and the extra 3 on this CD from the later of those sessions with drummer Stevie Bray replacing John Shearer. Once again Robin George has given it some 21st century polish at his Spanish Damage Control Music Studios. Byron's solo journey, post Uriah Heap, starts here but only reaches Lost And Found before Byron's untimely death in '85. Sound quality avoids the excess polish of most 80s rock productions. There's an odd muted quality to the sound of Byron's voice on the opener Rebecca, however his voice still demonstrates its power, beginning to wane on his later recordings. The dynamics are all there in Bad Girl, a classic subtle rock build up to vocal and guitar (Robin George again) fireworks. There's enough 70s rock style on the whole album to keep anyone happy who enjoyed Bob Ezrin productions (70s Alice Cooper, Lou Reed, Kiss etc). The surprise that makes this a keeper is the funky feel that keeps the pace way upbeat of heavy 80s ponderosity, although the most upbeat Never Say Die is in the wromg place and doesn't fit. The following track has enough diversity of musical influence combined with adolescent lyrics to stand up with any of the rock greats and this is the perfect album for tennis racket air guitarists. "This isn't a July 2010 release, it's from 2006" challenge plebs chorus, stage left, "The old fool's a bit late with this one." Indeed, replieth ye olde scribe, I thought Arvind had covered this one at the same time as Tao Ruspoli. This Mapleshade release fits the context here as American new punk, more LA than NY, but recorded on old skool 15ips analogue tape without compression and CD transfer at the lowest possible level to preserve dynamic range. 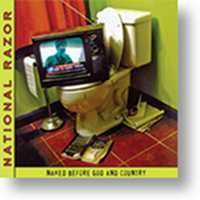 National Razor's material mostly concerns the preoccupations of middle class American youth and has the same mix of appeal as 50s Rock'n'Roll did for austerity oppressed post war Europeans. Despite Pierre Spray's flawless abilities with polished artistes, he's more than capable of mimicking punk production style without the usual punk production values. Hence, while there are moments that hark back to the Damned's days on Stiff, at Mapleshade punk drums sound like drums, not like wet cardboard beaten with a moist loofah. Everything Mapleshade produce tends to sound as it should and their sole attempt at down to earth rock is no exception. 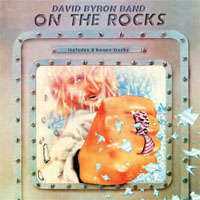 In the heat of July it's highly appropriate that we should get two albums called Chilled and refrigerator from Nine Below Zero and a third, On The Rocks from David Byron, and a naked number from National Razor; McEvoy avoids the puns just being onto a winner. None of them are 'cool' in the sense of Milt Jackson on Vibes. Indeed your old scribe's gig attending and music buying throughout the 80s mostly consisted of those from the 70s who continued to evolve, from The Clash and Bruce Springsteen to Tangerine Dream and Desmond Decker. This old scribe always describes the 80s as 'The decade that music forgot' in an ironic reference to the popular jibe at the 70's as 'The decade that taste forgot'. Let none of that prejudice prevail here, Byron's On The Rocks is the definitive post-Heap Byron. Angel Air's products are only slightly higher average recording level than Mapleshade (who proudly proclaim their lower average level allows you to turn it up louder for fully preserved peaks), despite the myth of heavy rock being the most compressed genre. Both these companies show the way it should be done. "All the old scribe ever reviews is old rock stuff, like he's going deaf or lost his middle aged mojo,", winge plebs, stage left, When are we going to hear about something else? When record companies or artistes have the cojones to offer them up to your old scribes lugholes, challenges the venerable one from a high place.